From scooters to self-driving cars, the future of mobility is a particular passion of ours here at TechFire. (In fact, before founding TechFire, our CEO David Murphy ran a transportation group funded by Elon Musk and other tech leaders.) 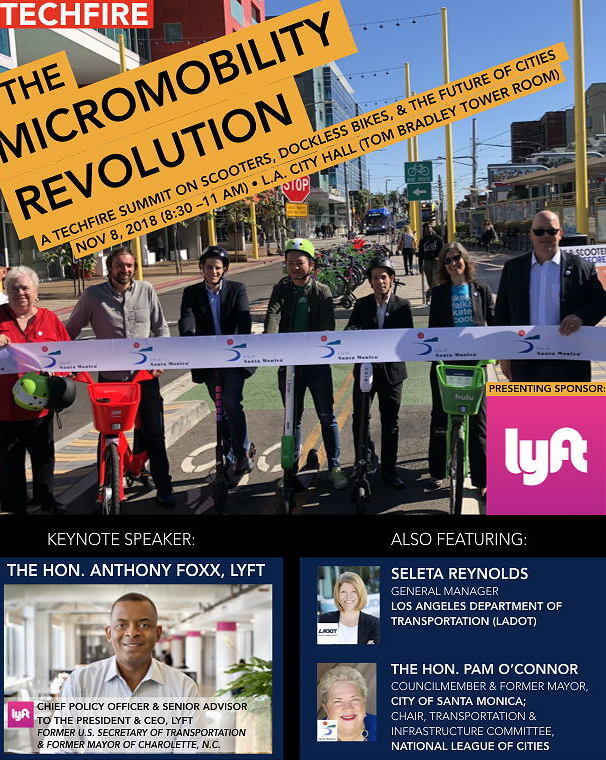 From a scooter summit sponsored by Lyft to a self-driving car summit broadcast nationally on TV, it’s a topic we keep coming back to time and again. Thanks to everyone who attended our standing-room only summit on the Self-Driving Car Revolution, and to Los Angeles Mayor Eric Garcetti's office for generously hosting the event atop Los Angeles City Hall. The event was broadcast on national TV, on C-SPAN -- view the video here. For more information about the summit, see selfdrivingrevolution.eventbrite.com.